* First and foremost, this stunning 2019 Range Rover is tuned for ultimate performance with a 518-horsepower 5.0-liter supercharged V-8 engine. An efficient 8-speed automatic transmission delivers the power to all four wheels, providing full-time four-wheel drive. Whether cruising down the highway or adventuring on a rocky mountain trail, this amazing Range Rover will handle it with ease. * The bold Corris Grey exterior is finished with the premium Black Exterior Package. Ranging from Narvik Black mirror caps to to a Narvik Black mesh grille, these beautiful accents deliver a sporty “blacked-out” appearance. Premium 22-inch gloss black 9 split-spoke wheels finish the sleek appearance of the exciting 2019 Range Rover. * Enjoy a whole laundry-list of luxury features including 20-way Ebony climate controlled front bucket seats, Rear Seat Entertainment Package with dual 10-inch screens, premium 825-watt 19-speaker Meridian surround sound system, Ebony Morzine headliner, heated windshield, front center console with convenient refrigerator compartment, Apple CarPlay and Android Auto phone integration, four DC power outlets throughout the cabin, Touch Pro Navigation system, power moonroof, and so much more! * Only best-in-class safety features would be expected on this iconic Range Rover, and this one does not disappoint. The premium Drive Pro Package features amazing safety features including Brake Assist, Lane Keep Assist, Blind Spot Assist, Driver Condition Monitor sends alert when driver appears to be tired, Traffic Sign Recognition, and Adaptive Cruise Control. The addition of the Park Pro Package offers Rear Traffic Detection and easy Park Assist. This beautiful and capable 2019 Range Rover is loaded with so many features; you will have to see it to believe it! 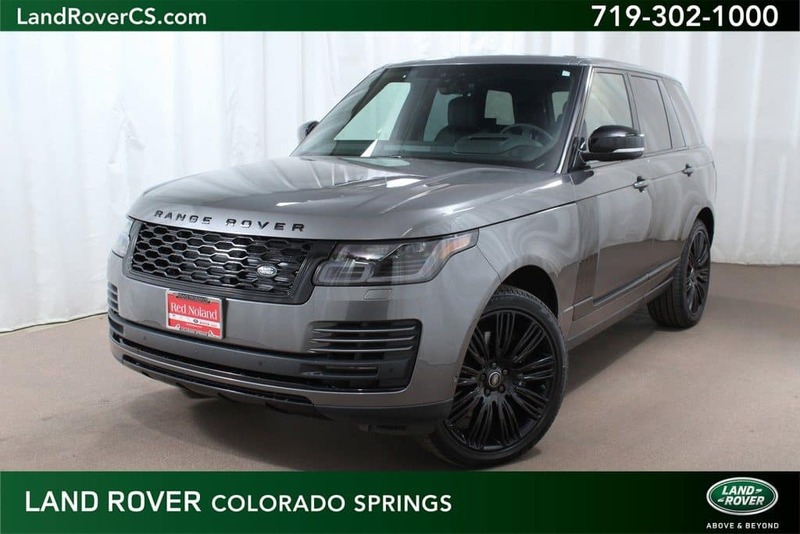 Stop in to Land Rover Colorado Springs to view this stunning Range Rover today.